Études sur la structure, le développement, la nutrition et la régénération des os, suivies d'expériences nouvelles sur la coloration des os et des dents au moyen du régime garancé. Strasbourg : G. Silbermann, 1864. Description : [ii] p., 1 [l.] fold. pl., 1-110 p., 1 [l.] pl. ; ill.: 1 phot., 2 chromolith. ; 25 cm. Photograph : 1 mounted albumen of specimens. Subject : Teeth and bone — Osteogenesis; pathology. Author caption: par Émile Joly de Montpellier (Hérault), élève de l'École impériale du service de santé militaire. Thèse présentée a la Faculté de médecine de Strasbourg. Abstract: Joly, E. & Joly, N. (1865), "Études sur la structure..etc." Toulouse: Mémoires de l'Académie impériale des sciences inscriptions et belles-lettres. Vol. iii, p. 136-156. Son of Nicolas Joly, (1812-1885). Nicolas Joly, with Félix-Archimède Pouchet (1800-1872) and Charles Musset were antagonists of Pasteur and germ theory. 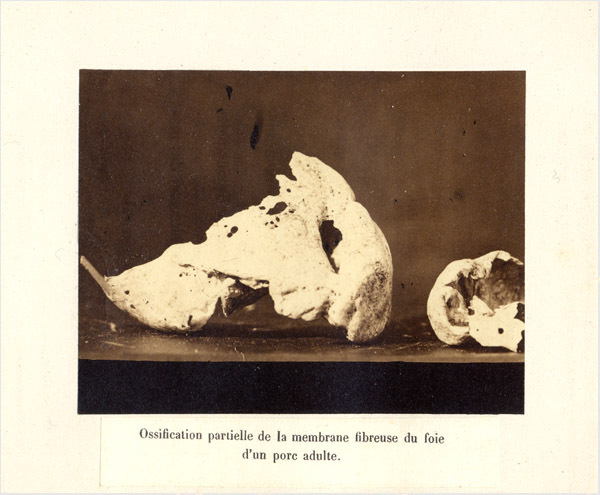 Photo caption: Ossification partielle de la membrane fibreuse du foie d'un porc adulte. Nous remercions aussi, bien cordialement, M. Victor Vigé , au talentet à l'amitié de qui nous devons la belle épreuve photographique représentant le foie ossifié d'un porc. — Page 156 of the abstract (vide supra). Only the abstract of Joly's doctoral thesis—published the following year in the Toulouse Mémoires—has a reference to the photograph. The abstract was coauthored by his father, Nicolas Joly, a professor of physiology at Toulouse who was notorious for his attacks against Pasteur and germ theory. Most library catalogs do not mention the photograph which depicts a specimen of rare hepatic calcification in a pig. Probably, a select number of copies were issued with the photograph freely inserted between the pages—or a second printing of the thesis with the inserted photograph was paid for and circulated among friends and colleagues by a proud father desiring of their acclamation for his son's achievement. My copy of Joly's thesis is in a later binding with the photograph and a slip of letterpress both mounted onto contemporary card stock as issued (18.5 X 13.5 cm) and bound behind two thin passe-partouts. The thesis is an ingenious search for what can be revealed about osteogenesis by introducing coloring agents such as madderwort into the diet of animals. Joly continued his research and published another paper on the physiological effects of coloring agents in diet for which he won a medical prize in 1866. Soon afterwards he settled into a career as a medical officer in the French infantry and directed his future studies to entomology.